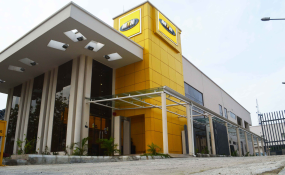 Telecommunication company, MTN Nigeria, has sued the Nigerian government to the tune of N3 billion. The firm, in the new suit, is challenging the legality of N242 billion and $1.3 billion import duties and withholding tax demanded from it by the Nigerian government. The embattled company, in the suit filed at the Federal High Court in Lagos, is demanding the N3 billion for general and exemplary damages and legal costs from the defendant. A judge, Chukwujekwu Aneke, on Thursday, adjourned the suit until December 3 for hearing after counsel confirmed that motions have been filed and served on parties. In the suit filed on September 10, the telecom firm is contending that the purported "revenue assets investigation" allegedly carried out by the Nigerian government for the period of 2007 to 2017 violates the Nigerian constitution. Also, the telecom firm is claiming that the government's decision conveyed through the Office of the AGF by an August 20 letter, violates the provisions of Section 36 of the 1999 Constitution. The firm is seeking a declaration that the AGF acted in excess of its powers by purporting to direct through its letter of May 10 a "self-assessment exercise" which usurps the powers of the Nigerian Customs Service to demand payment of import duties on importation of physical goods. It is also seeking a declaration that the AGF acted illegally by usurping the powers of the Federal Inland Revenue Service (FIRS) to audit and demand remittance of withholding and value added taxes. According to the suit, the telecom firm prayed for a declaration that the AGF's demand of the sums is premised on a process that is malicious, unreasonable and made on incorrect legal basis. The Central Bank of Nigeria had been at loggerheads with the telecom firm following sanctions over alleged illegal repatriation of funds. The CBN accused MTN Nigeria of improper dividend repatriations and demanded that $8.1 billion be returned "to the coffers of the CBN". Abubakar Mallami, the Attorney-General of the Federation, in a separate move, also slammed a tax bill on the firm, wherein he accused MTN of unpaid taxes on foreign payments and imports, asking it to pay approximately $2billion in relation to the taxes. According to the CBN, MTN and four banks flouted the "laws and regulations... including the Foreign Exchange (Monitoring and Miscellaneous Provisions) Act, 1995 and the Foreign Exchange Manual, 2006." The four banks--Standard Chartered Bank, Citi Bank, Stanbic IBTC Bank and Diamond Bank - were subsequently debited. They all denied wrongdoing. Hearing of the new suit has been scheduled for December 3.